Reading up on puppy training ideas and checking out Crating Tips is easy to do. Sometimes it is not so easy, though, to deploy all those great ideas when a puppy is standing before you louding balking at being housed in that comfy crate you want them to spend time in! If your new puppy settles down to play independently or falls to sleep when crated -- then there is no need to read further! But, if crating your puppy elicits protests that seem neverending..then perhaps the following can help. It is a given that crates are widely recommended with the safety of your puppy in mind and to very effectively prevent inappropriate behavior within a home. A crate should be thought of as a comfortable housing area. One of the most important suggestions at Crate Tips is to make sure that the going into a crate is a happy event from the very first time you place puppy into your crate! You should have treats on hand just for puppy's crate. Be sure a yummy is secretly pre-positioned within the crate to surprise and thrill your puppy. Make going "in" the crate an exciting time. Very fragrant goodies work best! Check your Pet Superstores' retail shelves for a treasure trove of options. Another key element to crating success is to moderate your responses should your puppy decide to protest while simultaneously assessing the cause and reason for the vocalizations. If puppy is vocalizing a need, be it food, water or to go potty or if puppy is experiencing an emergency in the puppy's viewpoint -- then your timely response to their vocalization is of course mandatory! Your puppy might be simply disagreeing with your decision on where she should spend the night. But if your puppy's complaints have ever -- even if for only a single time -- if those puppy's complaints have achieved the puppy's desired results -- whether it be your return to their line of sight, picking up the puppy in your arms, or even simply talking to your puppy -- it is just amazing the firm belief that puppies can grasp onto in which they believe that with all their heart that their continued crying will eventually bring you back to them. Determined little puppies they can be! If this has happened to you, you have successfully trained your puppy to cry for your companionship! Puppies need love and companionship and physical contact in their lives. If being crated is simply unacceptable in your puppy's mind -- perhaps your puppy doesn't like your choice of crates? Or -- how about opting for an even larger containment area that will keep puppy confined, but still safe? Miniature kennels measuring 4'x 4' up to 6' x 6' in size are readily available at pet superstores and that extra room to bounce around in like a puppy must do in life may be all that your puppy needs to be happy when it is necessary to confine them without yelps of protest. Add a couple of balls or easily squeakable toys or balls that dispense treats when rolled about and you might have your solution in hand. If it is only at night-time that your puppy demands your affection perhaps -- and if it is safe to do so -- pull your puppy up close so you can both be happy and rested the next day. Is there an outside area that is safe for your puppy to be placed in? Do you have a different puppy-proofed area that may prove to be a paradise for your pup to be placed in? 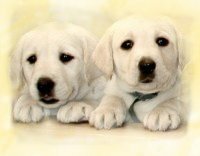 Pups perceive every thing in their life through a dog's viewpoint and although there are many facets to every subject, let's try to touch upon some other pertinent points while just focusing upon crating the puppy that doesn't want to be crated. Puppies from our home have slept nightly all together in an extra large crate, but in your home, when that crate door shuts they are entirely alone without a littermate to occupy their thoughts. 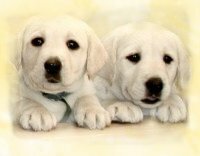 If you say, "shush" to your puppy's vocalizations, YOU might think you are saying, "shush" but to your puppy -- the words you utter are simply noises that will of course cause puppy to glance at you -- but your words do not mean "hush" to your puppy since your puppy does not speak English yet -- and in fact, your words to your puppy may encourage puppy to demand more of your attention since a response from you was received to your puppy's cries. Your puppy may easily mis-interpet your "shush" as interaction which is of course, what your puppy's goal is. If you want your puppy to comprehend your communication, perhaps you might try "growling" at your puppy -- growling at your puppy will instantly be understood by your puppy as displeasure on your part. Puppy may not connect what it is that is displeasing you, but your point will be made. However, like with any two family members with a difference of opinion. the disagreement you and your puppy are having over being crated could easily turn into a lively debate! You have many other options to you if you hesitate to growl at your puppy, do read up on things available to do during training at your local library or contact a number of dog trainers for personalized dog training assistance tailored to your home or environment. I suggest seeking out many opinions on training by a multitude of different authors or dog trainers because at some point, one of the options you encounter will seem workable in your home for you and your family. Bringing home a new puppy means a transitional period for both your puppy and your human family members whether it is your first dog being brought into your home or if it is your second dog in your life -- every puppy can be a completely different experience from the puppy that accepts the crate you want them to use to the puppy with an opinion and who isn't afraid to express it. Puppies are not yet the reasonable and mature adults that they will eventually grow into being as the months progress, puppies are very loving, very social beings with higher activity levels than their adult counterparts and the blending of them with our families is a reciprocal pleasure that brings tremendous joy to both human and puppy alike. Reading a number of books on "correcting training errors after they have occurred" that can help you and your family members avoid making those errors initially when training your new puppy. Make sure the entire household agrees on some fundamental parameters for your new puppy so that the puppy is living with consistent house rules. If one family member is primarily responsible for training, that's great -- but make sure that puppy will obey every person in the home, not just the primary care giver. A crying puppy is in need of something, if it isn't material, try love and affection putting yourself in your pup's current circumstances might be helpful to understand your puppy's surprise -- imagine if you just had moved to a new home and had to sleep in a new, strange bed, you'd appreciate lots of diversionary activities and extra doses of love, too!